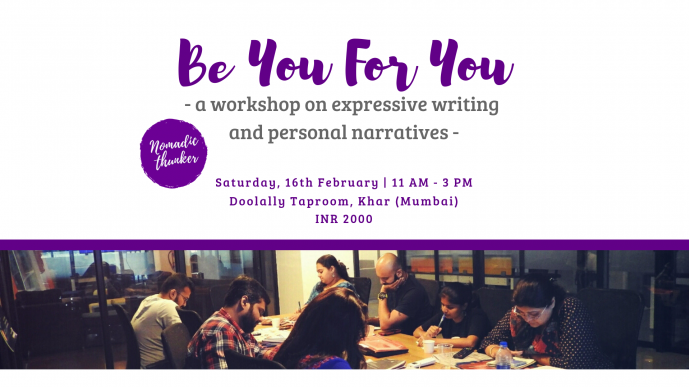 "We are the stories we tell ourselves" The purpose of the workshop is self-awareness using the pen and paper. It will comprise of guided activities that will enable participants to understand themselves better. Workshop open to all above 18 years of age. Participants below 21 years of age would have to be accompanied by a parent/guardian. Workshop content may not be suited for those below 15 years of age. The workshop is: (i) Language agnostic i.e. English is not a requirement (ii) for both, non-writers and writers i.e. the aim is to write to express, not impress Feedback from previous participants: (i) "Expressive writing can be a great tool to connect with oneself" (ii) "A medium to disconnect and to reconnect with myself" (iii) "I came here plagued by emptiness. I am going back with a toolkit and feeling much more encouraged" *** About the facilitator: Elita is a facilitator and freelancer who uses stories as a medium of working with individuals, groups, and organizations to improve both, intra and interpersonal relationships. Elita has been blogging for the past eight years on themes such as body positivity, travel, mental health, and well-being. For more information: https://nomadicthunker.com/be-you-for-you. Share "Expressive Writing Workshop "